I have installed Opera on Kali Linux. However, I have noticed that when I maximise Opera's screen, the three window buttons on the right upper corner are gone. I can't minimise Opera any more and also can't change Opera's screen size. This is a problem that really only concerns Opera, because with all other applications, I don't have this problem. My question is: is there a way to get those three buttons back when Opera is maximised? If not, then I hope that this bug will be fixed soon, because it's really irritating. What desktop enviroment does kali have (gnome/kde/xfce/something else)? Maximize, or fullscreen mode? Fullscreen mode is supposed to remove everything, while Maximize should have a title bar and window decorations. This is weird, because opera, unlike chrome or chromium, does not have its own csd (client side decorations), so it relies on the window manager of the desktop enviroment for the minimise, maximise, close functions. Needless to say I have no problem here (debian testing x64 with openbox). Xubuntu 16.04 32 bit. Also have no buttons in the upper corner when Opera is maximized. I only have Tab menu here. 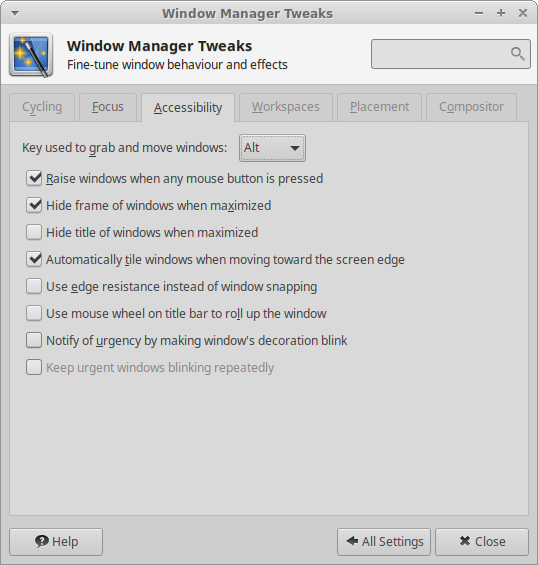 You can make it visible again, just follow the steps: go to Settings -> Window Manager Tweaks > Accessibility, and uncheck the checkbox on the left of "Hide frame of windows when maximized". I had the issue of a maximized Opera "fighting" not do be un-maximized or resized using latest LinuxMint (Cinnamon) – min | max/rest | close window decorations were visible, though. Using a swift mouse move it was possible to move the maximized Opera from one Screen to an adjacent, different sized monitor where it instantly maximized itself again. All those mouse interactions leading to flickering, by the way. I checked any of Cinnamon's "snap to *" settings but what did get me Opera restored was to save the session with V7 Session sidebar extension, closing Opera, deleting "Current Session" from the profile, and ultimately restoring the session from V7 Sessions. I guess, there is a bug – and perhaps it is the same the OP was suffering from. @l33t4opera Ok, thank you. It's solution. But I have a small display (Asus EeePC). When I uncheck this checkbox, another titlebar appears. The visible area of browser decreases. The windows buttons are also gone in the default install of Ubuntu 18.04. Surely there is a fix for this...? This also happens to me in ubuntu 18.04. @emoxam , I use Linux Mint 19.1 Cinnamon. Opera works normal. I have four buttons at upper right corner - Tab menu, Minimize, Restore, Close. It looks like Windows 10. @pindos Are you sure you are talking about maximized opera window ? Because i have these buttons too, until the window is maximized!